The ASUS ROG Strix B350-F Gaming is an excellent motherboard that is jammed back with features at an exceptionally good price! 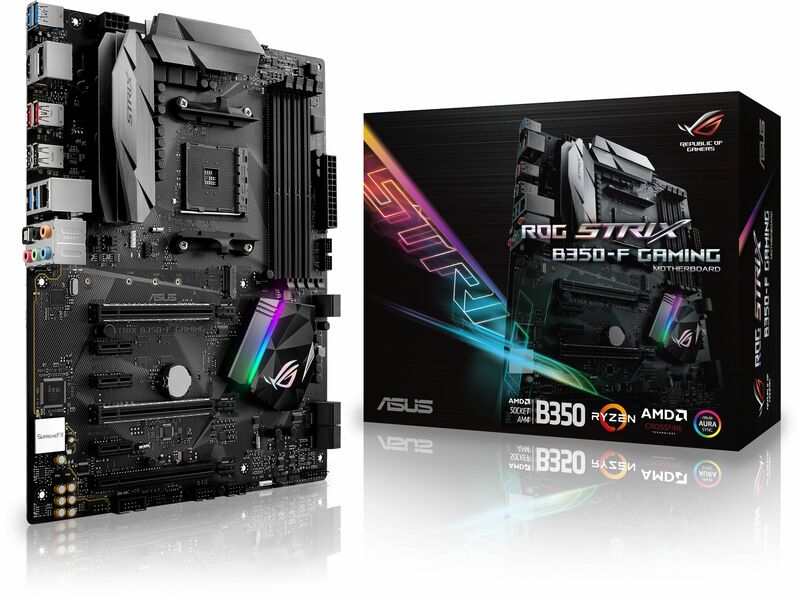 The ASUS ROG Strix B350-F Gaming continues the proud legacy of the Pro Gaming series and features advanced ROG innovations. 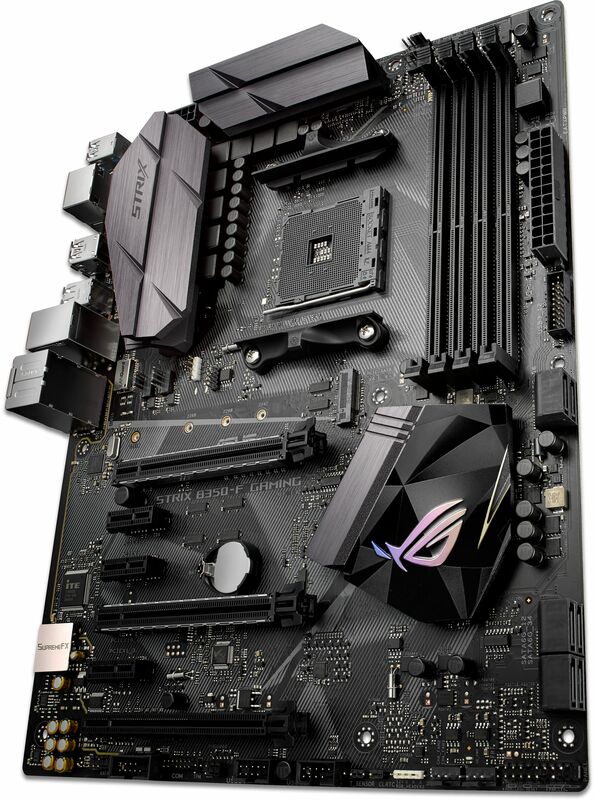 ROG Strix B350-F Gaming motherboards combine bold aesthetics with premier performance and incredible audio to deliver unrivalled gaming experiences and style. Support for the latest AMD processors and technologies, plus exclusive ROG innovations, take performance to the next level to give you the edge against opponents. ROG Strix B350-F Gaming charges every movement of every game with thrilling energy and equips you with epic speed and agility. Join the Republic with ROG Strix B350-F Gaming and dominate your game! This motherboard supports AMD Ryzen processors, 7th Generation A-series accelerated processing units (APUs) and Athlon CPUs. The high-performance Ryzen processor supports up to eight cores, and is based on the innovative Zen core architecture. The 7th Generation A-series APUs feature integrated AMD Radeon R-series graphics. AMD AM4-socket processors feature dual-channel DDR4 memory, native 5Gbps USB 3.0 and 16 PCI Express 3.0/2.0 lanes for superb performance. The AMD B350 chipset delivers outstanding overclocking capabilities for the latest AMD AM4-socket Ryzen processors, 7th Generation A Series APUs and Athlon CPUs. It is optimised for AMD CrossFireX. It also provides two 10Gbps USB 3.1 ports and six 6Gbps SATA ports for faster data retrieval. Create your own custom LED lighting effects with the intuitive Aura software. Cast a stunning multi-colour glow across your build with the powerful RGB LEDs built in to ROG Strix X370-F Gaming, or attach separate RGB strips using the two onboard 4-pin headers. You can even use both at the same time and enjoy perfect lighting synchronisation. Fire up Aura and enjoy the creative freedom of nine different lighting themes. ROG Strix's SupremeFX audio technology has levelled up, delivering an exceptional 113dB signal-to-noise ratio on the line-in connection for best-ever recording quality — and 120dB on line-out for crystal-clear sound! Asus have also added a low-dropout regulator for cleaner power delivery to the SupremeFX S1220A codec, plus Texas Instruments RC4580 and OPA1688 op-amps for high gain with low distortion. It all adds up to audio that envelops you as never before! With support for DDR4 memory, ROG Strix B350-F Gaming lets you drive memory frequencies to 3200MHz and beyond when overclocked! ASUS-exclusive T-Topology circuit design provides superb memory-overclocking capability to unleash the full power of DDR4 by minimising coupling noise and signal reflection. With innovative equidistant memory channels, T-Topology delivers balanced control and powerful overclocking compatibility. You don't need to be an expert to max out gaming performance on your ROG Strix X370-F Gaming build — because 5-Way Optimisation sorts all the complex settings with a click, for instant, highly-controllable performance boosts! ASUS' exclusive technology dynamically optimises essential aspects of the system based on real-time use, so you get superb CPU performance, everyday energy savings, ultra-stable digital power, cool and quiet fans and even networking and audio settings that are tailored for the apps that you are using. In short, 5-Way Optimisation ensures that your PC is perfect for gaming, entertainment, productivity or just about anything else! Play quieter and cooler with advanced fan and water-pump controls for the ultimate in undisturbed gaming. With onboard thermal sensors and hardware-level 4-pin/3-pin PWM/DC mode detection, Fan Xpert 4 makes sure every fan achieves the best balance of high cooling performance and low noise - so you enjoy all the performance you demand with none of the racket! The ROG Strix X370-F Gaming features the very latest Intel Ethernet Controller I211-AT for faster, smoother gaming. Intel's LAN has the serious double advantage of reducing CPU overhead and offering exceptionally high TCP and UDP throughput, so there's more power for your game and your gameplay. With x4 PCI Express 3.0/2.0 bandwidth, M.2 supports up to 32Gbps data-transfer speeds. It is the perfect choice for an operating system or application drive, making your whole PC and professional apps work as fast as possible. With one USB 3.1 Type-A port and one reversible USB 3.1 Type-C port, you'll experience data-transfer speeds of up to 10Gbps — twice as fast USB 3.0. USB 3.1 is also completely backward-compatible with existing USB devices, so you'll be set for breakneck USB 3.1 speeds with every connection. And as an added bonus, ASUS-exclusive USB 3.1 Boost technology automatically accelerates USB 3.1 performance even further.